Sometimes a mistake becomes a masterpiece. Don’t get me wrong. Sometimes a mistake is a true disaster destined for the bowels of a landfill. Not long ago I spent like $12 on white American cheese for a restaurant-like queso dip. Well, big spender here didn’t buy enough cream, and it turned out to be a thick, solid, clumpy waste. Depressing. Now let’s focus on a good experience. Want to? There’s a taco cantina nearby that has a salsa appetizer offering three versions. Once of them is always a a seasonal creation. 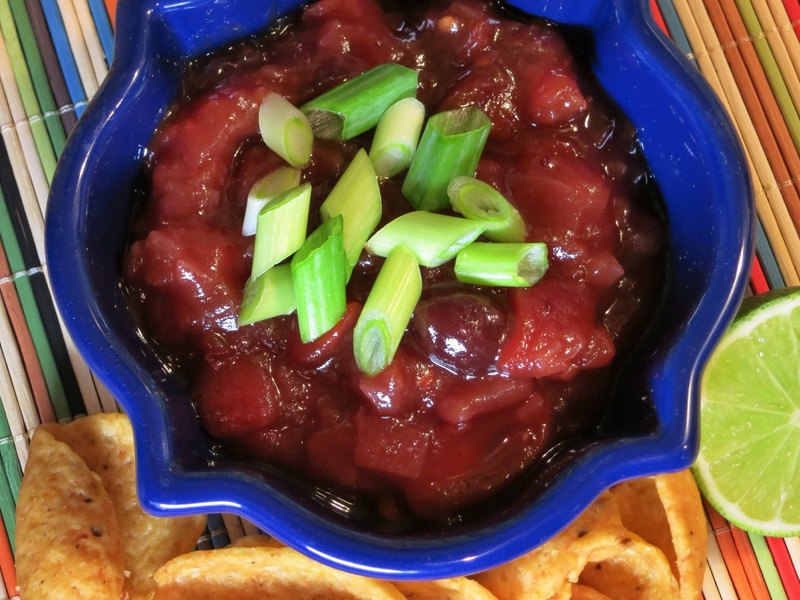 One of our favorites was the cranberry salsa. It was sweet, tart, and smoky. This joint claims that it doesn’t use any canned products. Either the cranberries were a frozen variety or the fresh kind, which would be mind-blowing. 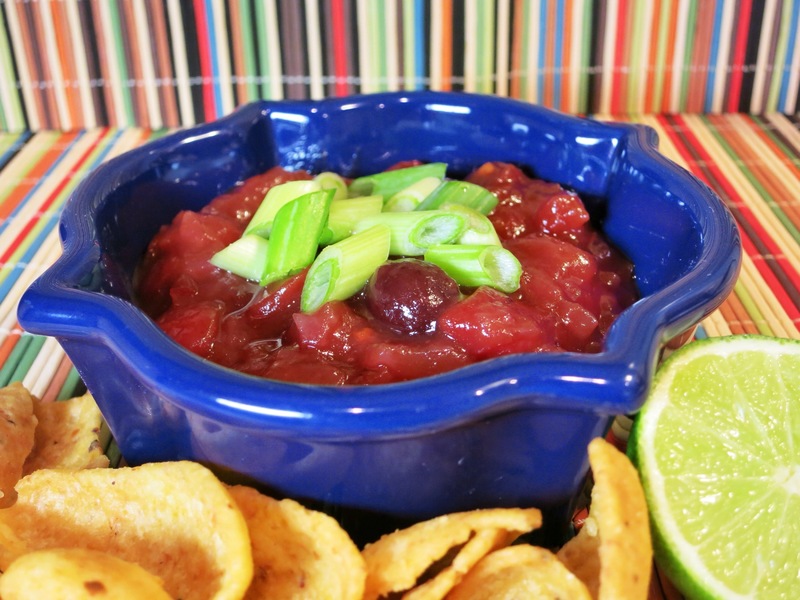 I set out to recreate the cranberry salsa. To me, the concoction seemed to bee cooked, not a fresh-tomato salsa. 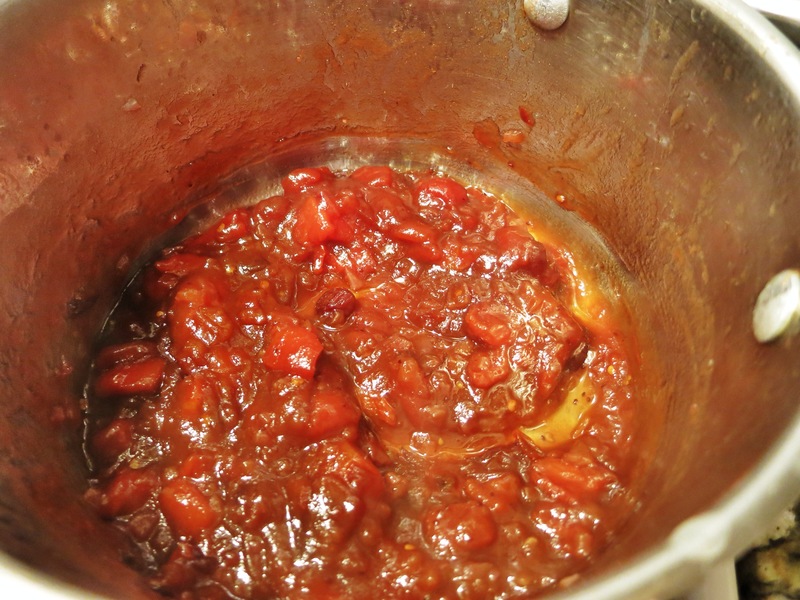 My version turned out to be pretty darn thick, almost like a jam, not much of a salsa. I think I reduced it a little more than I should’ve, but you know what? It was darn delicioso! I chose the whole berry cranberry sauce because you’d still get bits of the berry throughout the jam. If you have them, put on rubber gloves and chop up the chipotle pepper. If you don’t have gloves, be sure to avoid touching your eyes, nose or lips after handling the pepper. 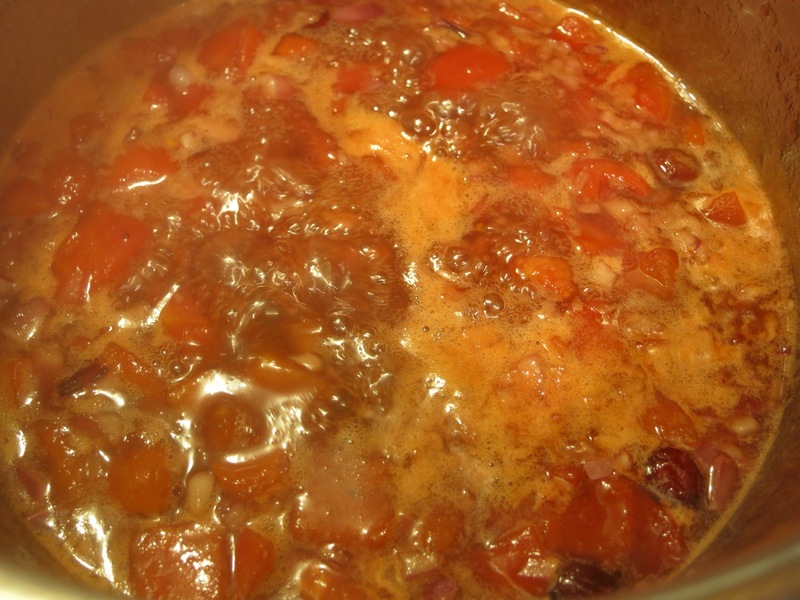 Put the cranberry sauce, the chopped chipotle, and all the other ingredients, including a good pinch of salt, into a medium-sized pot. Stir. Bring the mixture to a boil and let it boil for 20 minutes, stirring frequently. You’ll be able to track the progress of the reducing process by looking at the line around the pot. It’ll get lower and lower as time goes on. Taste and add more salt if needed. 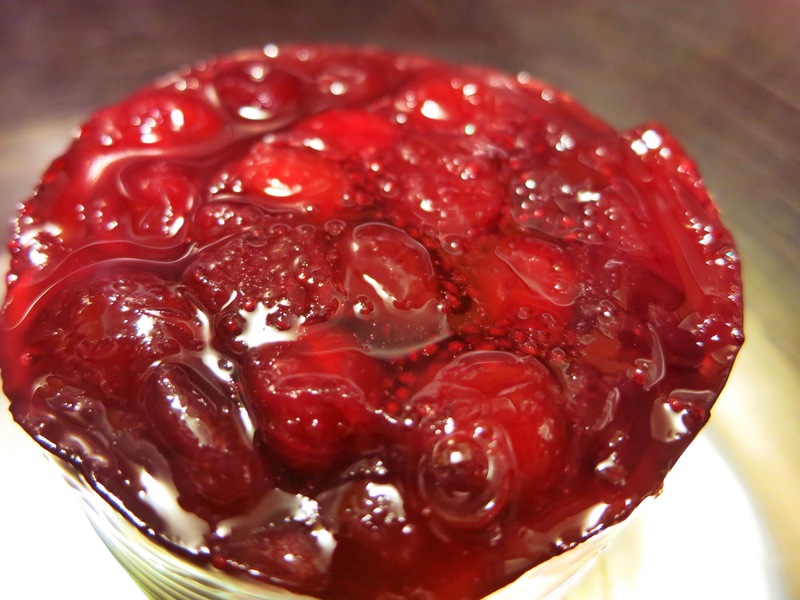 Allow the jam to cool or at least reach room temperature before serving. We ate it as a dip with tortilla chips. It’s rich, bright with a little tang from the cranberries, sweet from the tomatoes and the sugar, and hot and smoky from the chipotle and adobo. I recommend topping it with a sprinkle of sliced green onions. You could serve this with crackers and cream cheese, too. It’s a great Thanksgiving Day appetizer or snack. 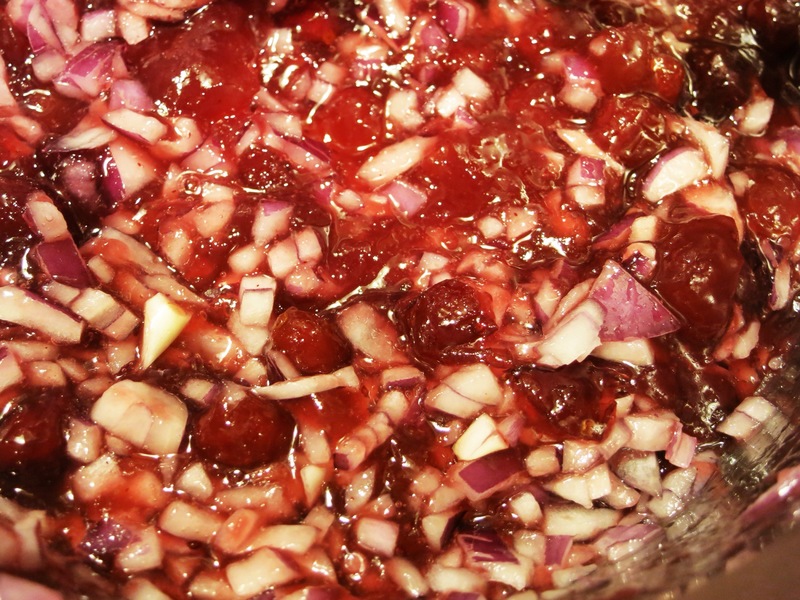 And you could use it with leftovers by making a turkey wrap with some mayo and this cranberry chipotle jam. 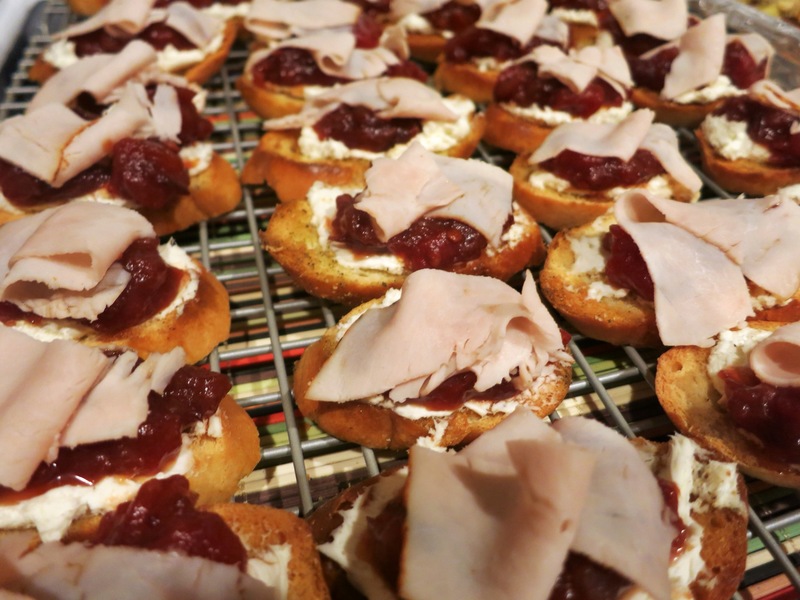 For our Halloween party I made a Thanksgiving crostini. I toasted slices of baguette with olive oil and poultry seasoning. Then I added a schmear of whipped cream cheese, a dollop of the jam, and a slice of deli turkey. It was a hit! It would make another great Thanksgiving Day snack or appetizer, kind of foreshadowing the meal to come. Look at me using big literary words on a food blog. I’d also suggest adding this to a taco. I think it would be great in a corn tortilla with shredded chicken or pork or even leftover turkey. So what if it didn’t turn out to be salsa? This mashup was no mistake. Before you toss it, try it. Remember that. 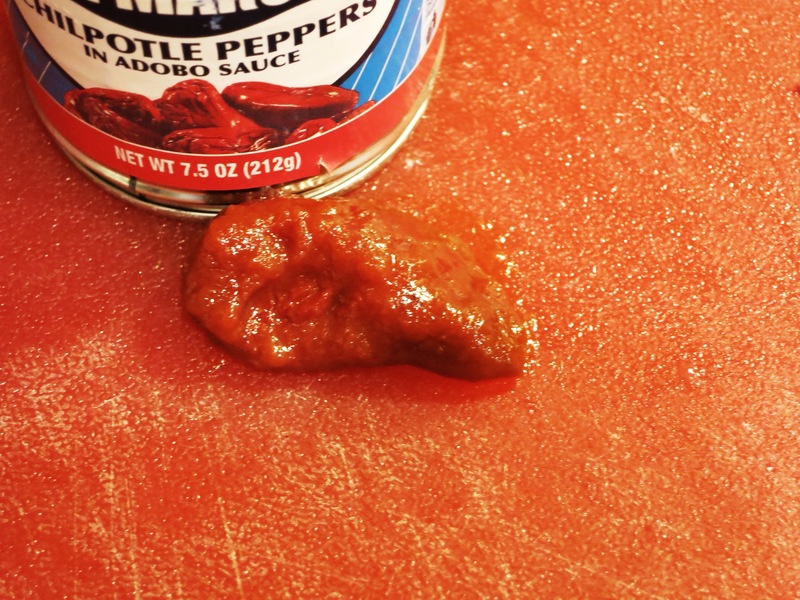 Tip: Put the leftover chipotles and adobo in a resealable bag, squeeze out any air, and seal it up. Pop it into the freezer. Anytime you want a little spice and smokiness in a dish, just cut slices off the frozen log and add them to whatever you’re cooking.